After another marathon bladder achievement (10 hrs, my own PB), this morning we got the result “pregnant 1-2 weeks”. And while this is suggestive of the hormones slowly seeping out of my system, it was still positive. And so to the clinic we went. True to his word, our wonderful consultant saw me first thing. He was lovely, and very compassionate. This is so what we need in these professions. The scan confirmed a miscarriage. My ovaries are fine and everything else is normal, which is reassuring given the pain I’ve been feeling. The only thing remaining to do is another test at the end of next week, to see a “not pregnant”. This may seem like unnecessary torture, but it is purely to eliminate the unlikely scenario of an ectopic pregnancy. We discussed again why this could be happening. And it still boils down to naturally “faulty” embryos. It’s a sad fact of life that approximately 60-70% of fertilised human embryos are lost between fertilisation and birth, with the majority of those losses happening in the first 12 weeks of a pregnancy. It is a numbers game. Make enough embryos, and ultimately one should work. Anyone who has tried to get pregnant naturally for more than a few months can attest to the haphazard, luck-of-the-draw nature of this process. The only difference between this and IVF is that with IVF, you know a fertilised embryo is inside you from the get go. Without genetic screening, similar odds apply. We did talk today about genetic screening. The fact we have a healthy son strongly suggests there are no problems on that front, and the process of screening itself decreases the viability of the embryos. Our consultant said he would not recommend this avenue of investigation for us. This is still a relatively new science though – perhaps in the future it will be incorporated into IVF as standard. But for now, it is not relevant for us. We have one embryo left on ice. It’ll stay there over Christmas, and as 2019 rolls around, we will begin the process of trying again with our final shot. We have also discussed what happens next, should that final embryo not work either. I suggested a repeat of the laparoscopy and ovarian diathermy we had prior to conceiving Toby, followed by another course of Clomid. Our consultant agreed, saying he was about to suggest the very same. We know this line of treatment has worked before. That is, of course, no guarentee that it’ll work again. But it would be a cheaper option than more IVF, and although it definitely has its draw backs (surgery, for one), it is perhaps not as emotionally draining as IVF. We are sad. We are tired. We are hurting. Now I will drink wine. Now I will run again. 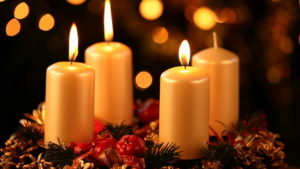 Now I will look to Christmas and the hope that comes at the end of the waiting that is advent.